1064cc air cooled vee twin. 2 valves per cylinder. Fuel Injection. 3 way catalytic converter. Steel spine frame with Ohlins fully adjustable suspension front and rear. Brembo Goldline linked brakes, twin 320mm discs with 4 piston calipers at the front and single 282mm disc with two piston caliper to rear. This test is something of a pilgrimage for me, as the last Moto Guzzi I rode was also a Le Mans, back in about 1982. Then the Le Mans was considered a fire breathing monster of a bike. 850cc and slim as a whippet, it was one of the fastest production bikes on the road, even then, and handled in the way that only Italian bikes could at that time. That it was cripplingly uncomfortable, not especially reliable and had suspension that achieved stability by being virtually solid seemed not to be an issue at the time. I loved my fire engine red Mark II Le Mans, and only sold it because the shaft drive made it too difficult to change the gearing for racing. So here I am. 22 years later and I am out in the wilds of Oxfordshire on a new Le Mans. 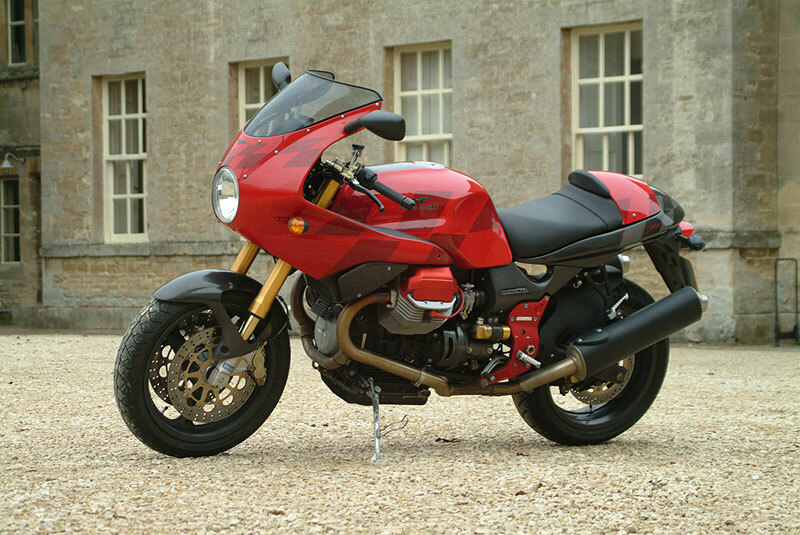 This version, the Rosso Corsa, sits at the top of the Moto Guzzi road bike pile, being blessed with very pretty Ohlins suspension at each end as well as the latest incarnation of their 1100cc motor. And it is fair to say that times have changed somewhat. And for the better, too. But Moto Guzzi Le Mans is a very strong name, and anyone who remembers them of old will have some expectations as a result. So let’s have a look at what hasn’t changed. The motor, of course, is bang up to date. Well, actually, it isn’t. While there is the latest, state of the art, fuel injection feeding it, the actual lump is the same air cooled 90° transverse vee twin that it was in 1982. Or 1972, for that matter. It looks better finished, for sure, and it’s now blessed with electronic ignition instead of points, but to all intents and purposes the engine hasn’t changed. And why should it? It’s a strong, compact and efficient motor which is relatively cheap to make and easy to work on. The trademark shaft drive is effective and unobtrusive and in the wise words of an old engineer, if it ain’t broke, don’t fix it. Guzzis always had linked brakes, even before Honda reinvented them. 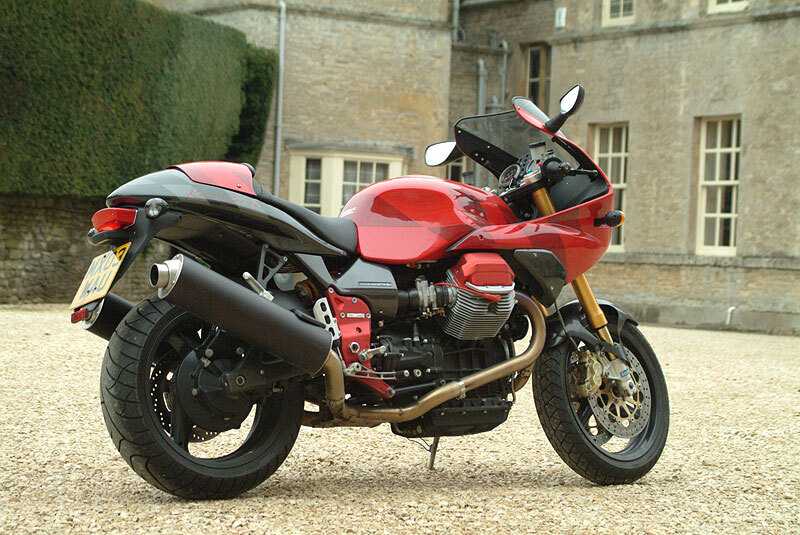 They still do – any twin front disc Moto Guzzi has the left disc operated with the rear, from the brake pedal. It’s an efficient, simple setup that gives bags of feel and keeps the bike secure and stable even under serious braking pressure but manages to do this without any electronic gadgetry of any kind at all. In fact, the linked brakes are so good that it is possible to lock the rear without locking the front as well – that’s pretty sensitive for a brake pedal. Instrumentation is as basic as I remember as well, with a speedo and tacho joined by a small cluster of warning lights. Other than a fuel warning light there are no concessions to the fact that this is a 21st Century bike. No clock, no LCD displays. Everything is analogue, including the trip meter which is reset the traditional way by turning a knob on the side. And the sidestand is still a long reach forward, in front of the left hand cylinder. Perfectly useable, but something a little out of the ordinary. But there have certainly been changes. For a start, I am over a hundred miles into a journey but I’m not in pain. 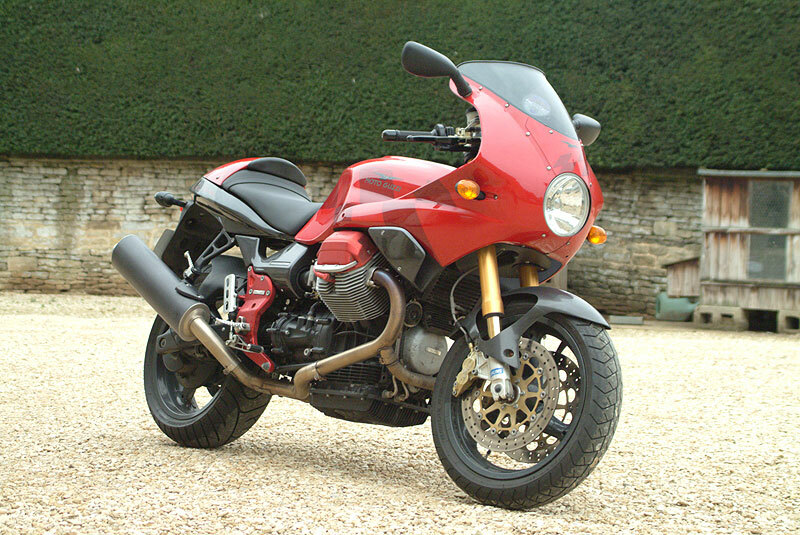 The Guzzi is big by sports bike standards, and that means that there is room to move, room to stretch and room to be comfortable. The big seat is generously padded and the reach to the bars is just right. Add that to a large, protective upper fairing and you’ve got somewhere that is quite a pleasant place to spend several hours at a time. The suspension is compliant but effective, absorbing the worst failings of the Department of Transport without removing fillings or jarring the spine and still transmitting enough feedback to ensure that the rider knows exactly what is going on. The standard adjustable steering damper does its job without being intrusive but backing it right off on the motorway did give me a distinct feeling that it is more than just a styling accessory. A couple of clicks cured a slightly unstable feeling and there were no more concerns throughout the test. Performance-wise, it’s not unreasonable to say that the big Guzzi has fallen slightly behind the opposition. 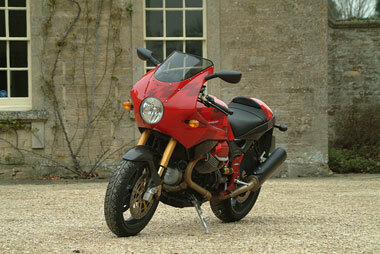 While it is by no means a slow bike, it is comprehensively outgunned by even an average sports 600. Except, of course, when it comes to torque. An 1100cc motor will never be gutless, and the Le Mans is a great example of what a relatively low revving but very torquey motor can do, especially when set up for performance. Pulling away is never a problem, especially since Moto Guzzi have discovered the delights of a clutch that can be worked with two fingers rather than both hands, and the easy character of the engine soon comes to the fore. But there is another side to this bike. There is a distinct power band, and once within it the motor pulls hard, revving happily up towards the red line. What soon becomes apparent is that although you can simply ride the torque and potter around making very little effort, this is a bike that really rewards the effort you do put in. Handling falls into a very similar category, with the easy going nature of the bike making it relaxing and forgiving when required but still offering enough agility, ground clearance and feel to make for a distinctly sporty experience should you approach the ride in a more committed fashion. Again, this is no ultra quick steering scalpel of a bike, requiring considerable effort to turn, but it is accurate, stable and rewards a smooth rider who is prepared to make the effort. Comparisons are always a risky game, but this bike reminded me very much of the Ducati 1000DS - our 2003 bike of the year. It's a little bigger and a little harder work but the overall riding experience and the satisfaction are similar. Plus, of course, both can trace their lineage back to the dawn of time and both are overlooked by the rider seeking a quick adrenaline fix. Which is their loss, because both are fine motorbikes in their own right. To sum up, then, I liked the Moto Guzzi Rosso Corsa a lot. Sure, it isn't the fastest or best handling bike I have ever ridden. Nor was it the most comfortable or the most economical. But it did everything very well - far better than any Moto Guzzi I have ridden before - and did some things better than many other bikes. It has masses of character, it looks to be quite well screwed together, it has a very distinctive style and a history that many makers would die for. It's far more practical than most sports bikes although the pillion seat is only recommended if you intend to get very close indeed to your passenger, and then only for a short distance. Shaft drive may be terribly unfashionable but it has a lot going for it and Moto Guzzi have been doing it for so long that they seem to have overcome any of the potential issues that can arise with it. There is a beautiful set of alloy performance cans available for it that remain road legal but make the sound far more like a big vee twin. They also, when combined with a new chip, liberate a further 12bhp which should not be sneezed at. In fact, the only real criticism I have of the bike is the headlight. It looks great but I fear the days of the single headlight on sportsbikes are numbered, because it simply fails to provide enough illumination to make the sort of progress you'd otherwise be able to achieve at night anything other than a game of high speed blind man's bluff. Which is probably not a great idea. If you fancy something a bit different take a look at one of these. They're great bikes and fantastic value to boot. And that can't be a bad thing.